The small size of this chairside table will be loved by homeowners of large and small spaces alike. It is designed to help you create a casual room style with a relaxed ambiance. 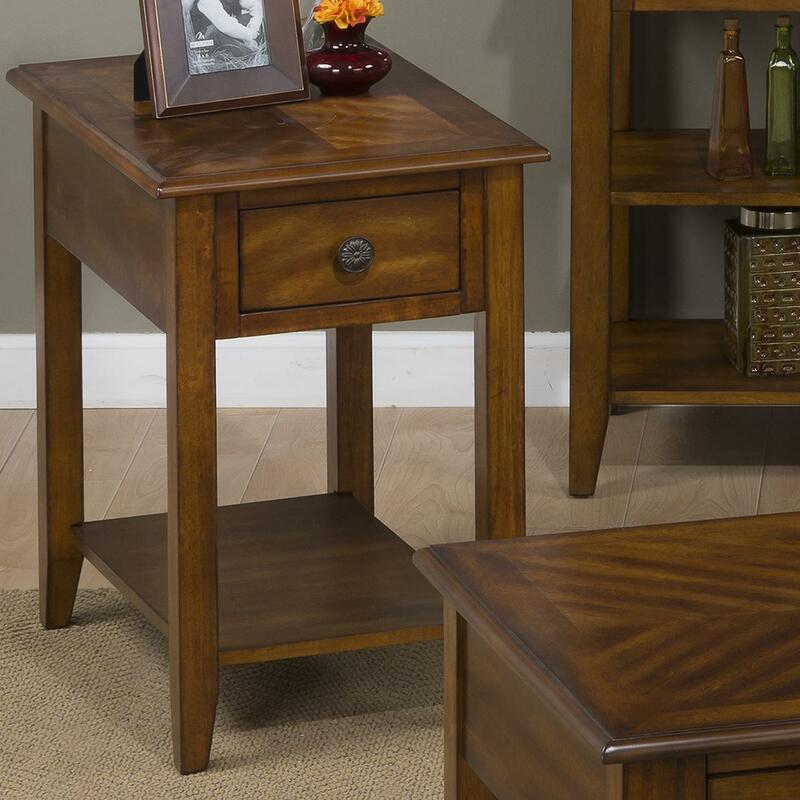 Designed to make your living room feel like a home and not a showroom, this affordable end table features a medium brown tone over birch veneers. English dovetails are used in the construction of the piece allowing for a higher quality construction. 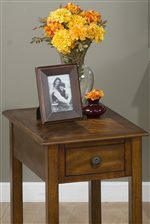 This table is complete with one drawer, one shelf and decorative floret drawer pulls. The Medium Brown Chairside Table for Small and Compact Spaces at Ruby Gordon Home in the Rochester, Henrietta, Greece, Monroe County, New York area. Product availability may vary. Contact us for the most current availability on this product. Handles & Hardware Round floret hardware for a hint of elegant detail. Case Detail Straight legs with beveled edging on table tops. Storage One decorative drawer with storage shelf below. Description: Top Smooth finished table tops with softly rounded edges. Case Construction Made of birch veneers with English dovetail joints. The Medium Brown collection is a great option if you are looking for Casual furniture in the Rochester, Henrietta, Greece, Monroe County, New York area.